PEORIA, Ariz. — Derek Norris hit a two-run homer, doubled in two more and threw out a pair of runners trying to steal, leading the San Diego Padres to a 17-5 victory over the Texas Rangers on Tuesday. Jabari Blash of St. Thomas also homered for the Padres, who scored nine runs in the first four innings against Rangers starter Colby Lewis. Cory Spangenberg went 2 for 3 and drove in two, and Alexi Amarista had two hits and two RBIs for San Diego. “A few of the guys are starting to swing better. Especially the guys we’re going to rely on this year. 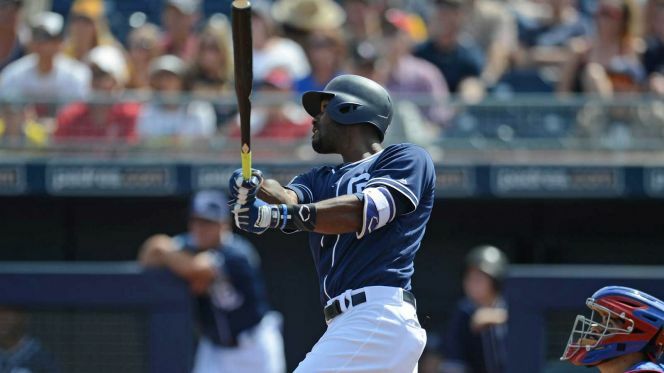 They’re getting more comfortable in the box,” Padres manager Andy Green said. It was Blash’s third home run of the year. The St. Thomian’s power comes as no surprise as he leads the Padres in home runs, but unfortunately he also leads the team in strikeouts, with 15 k’s in 34 at-bats. “He’s making people notice, isn’t he?” a smiling Green said. Rangers: RHP Yu Darvish threw a 30-pitch bullpen session as he works his way back from major elbow surgery. … OF Delino DeShields left the game with mild right biceps soreness and will be re-evaluated Wednesday. “It’s just bothering me a little bit,” DeShields said. “It’s one of those things that’s happened before and it goes away. Today it just lingered a little bit longer than it usually does.” … 1B Ike Davis (sprained knee) is beginning baseball activities but is not ready to play in games yet. … OF Ryan Cordell remains out with a sprained right ankle. Each team lost a ball in the high, sunny sky over Peoria Stadium. Blash fought the sun and had Choo’s third-inning fly ball go off his glove in the left-field corner for a hit. And four Rangers converged on Norris’ double before it dropped in front of a sliding James Jones in the bottom half. The Rangers and Chicago Cubs will play a doubleheader at Texas’ spring home in Surprise on Wednesday. The first game is the regularly scheduled spring training contest, followed by the second annual Rangers-Cubs Futures Game 30 minutes after the conclusion of the big league game. Rangers: Derek Holland pitches against the Cubs and Kyle Hendricks on Wednesday. It will be Holland’s fifth spring training start.